dSploit is the professional toolkit for Android network analysis and penetration suite. dSploit used to perform network security assesments on mobile devices. With dSploit allows you to analyze, capture and manipulate network packets. In addition to the analysis, dSploit even allow people in the middle attack for a number of network protocols that you can monitor and inject packets into the network and spoof your identity. It allows you to intercept wireless network traffic and mess with the way you want. After dSploit run, you will be able to easily map your network, live fingerprint host operating system and run the service, search for known vulnerabilities, cracking many tcp logon procedure, perform man in the middle attacks such as password sniffing (with general surgery protocol), real time traffic manipulation. dSploit Android Network Penetration Suite is still in beta and stable releases will be available as soon as possible. 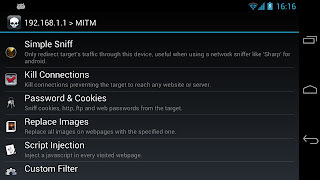 WiFi Cracking : The WiFi scanner will show in green access points with known default key generation algorithms, clicking on them allows you to easily crack the key, supported models: Thomson, DLink, Pirelli Discus, Eircom, Verizon FiOS, Alice AGPF, FASTWEB Pirelli and Telsey, Huawei, Wlan_XXXX, Jazztel_XXXX, Wlan_XX, Ono ( P1XXXXXX0000X ), WlanXXXXXX, YacomXXXXXX, WifiXXXXXX, Sky V1, Clubinternet.box v1 and v2, InfostradaWifi. RouterPWN : Launch the routerpwn.com, service to pwn your router. Trace : Perform a traceroute on target. Port Scanner : A syn port scanner to find quickly open ports on a single target. Inspector : Performs target operating system and services deep detection, slower than syn port scanner but more accurate. Vulnerability Finder : Search for known vulnerabilities for target running services upon National Vulnerability Database. Login Cracker : A very fast network logon cracker which supports many different services. Packet Forger : Craft and send a custom TCP or UDP packet to the target, such as Wake On LAN packets. MITM : A set of man-in-the-midtle tools to command&conquer the whole network. Simple Sniff : Redirect target's traffic through this device and show some stats while dumping it to a pcap file. Password Sniffer : Sniff passwords of many protocols such as http, ftp, imap, imaps, irc, msn, etc from the target. Session Hijacker : Listen for cookies on the network and hijack sessions. Kill Connections : Kill connections preventing the target to reach any website or server. Redirect : Redirect all the http traffic to another adtress. Replace Images : Replace all images on webpages with the specified one. Replace Videos : Replace all youtube videos on webpages with the specified one. get 4 emаils with the exact same comment. can removе mе from that ѕеrvicе?